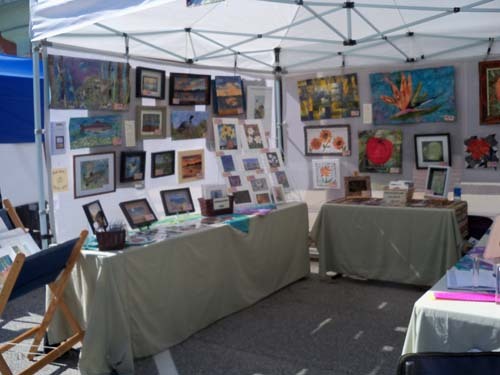 The summer art show season is in full force here in Maine. There are so many shows that, if you want to be in one, you do have to pick and choose for each weekend. From July 2 through September 17, I will do 12 outdoor shows. My schedule for this summer has evolved into 3 weeks of shows, a couple of weeks off, three weeks of shows, a couple of weeks off, and then the final three weeks of shows. That’s a doable schedule without making myself crazy. 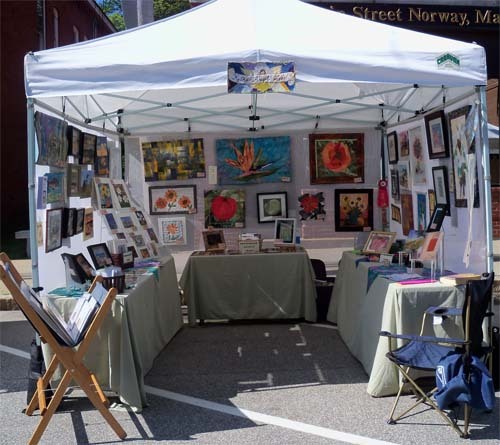 So here’s my booth set up in Norway, Maine for their annual art festival. This was my third year in Norway and I saw many repeat visitors. The day was beautiful except for some high winds. Many artists around me lost items as their tents and/or tables collapsed. You could hear glass breaking after a big blast of wind. One big gust hit my right side wall and knocked over the tables. Fortunately, nothing broke and I didn’t lose anything. The Norway show was this past weekend, July 9. 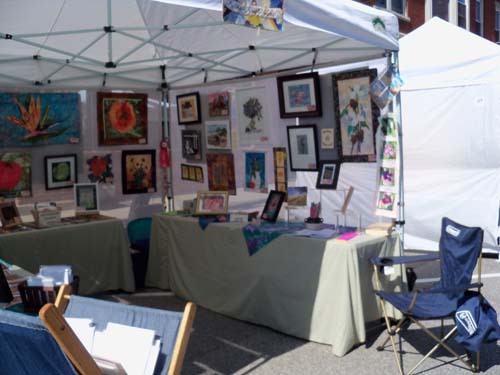 The previous weekend I was in Bethel for annual Bethel Art Fair sponsored by the Mahoosuc Arts Council. Next weekend (July 15-17, 2011), I’ll be at the Yarmouth Clam Festival. This show is three days and includes many different activities besides just the art show. As the name implies, there will be lots of clams done up in a variety of ways. Next post will be about some work I’m finishing up – a sunrise tryptich. It’s coming along nicely and I’ll pictures for you.